Excuse the lack of labbit cooking photos. Pipkin hopped all over the warren with the little memory card thing, but couldn't find the camera! All he found was an iPhone. Thank goodness for instagram. This recipe goes out to Pipkin's friend Lisa, who recently gifted him with a Cuisinart Immersion Blender and it is the best thing ever! No more scooping soup into the food processor little by little and transferring to a second pot. Labbits hate baths and having to clean extra pots. Hooray for immersion blenders! You can print out the recipe here. Trim the bulb end and the tough, dark green leaves off the leeks. Using only the white and light green stalk, cut lengthwise, then rinse under water to remove any sand and soil. Chop into 1/3 inch (1 cm) slices. Melt butter in a pot over low heat. Add the leeks and stir to break apart. Cover with a lid and cook for 10 minutes, checking often to ensure the leeks do not brown. Add the broth and potatoes. Bring to a low simmer and cook for 20 minutes, until the potatoes are soft. Remove from heat and allow to cool slightly. 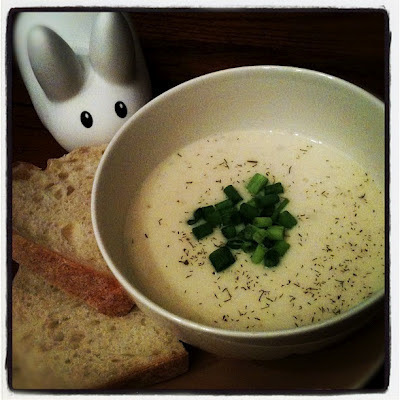 With an immersion blender, blend the soup to your desired consistency. Some labbits like their soup with bits of potato here and there, others like their soup thick and creamy with no potato bits. If you don't have an immersion blender, transfer to a food processor to blend, then return soup to the pot. I made this yesterday and it was so yummy and comforting.